Here’s a little story about salon dispensary organization, just in case you are starting to feel like you’re going to disappear into the abyss one day soon. Do you take pride in your salon and how it looks and feels, and not just in the waiting room or on the guest floor? 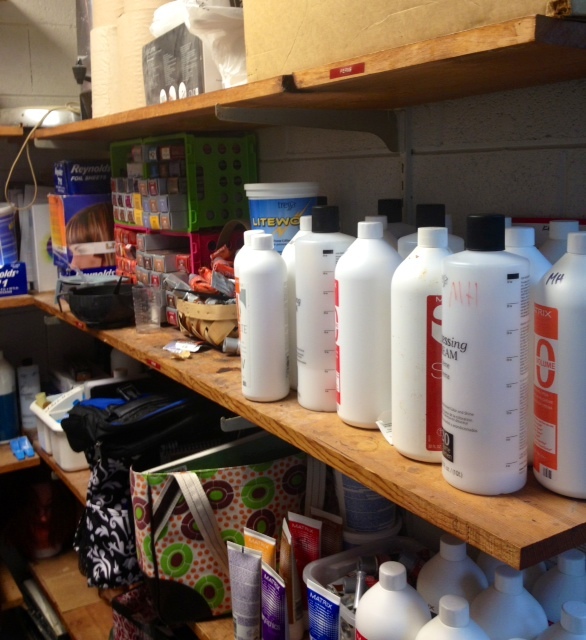 Your salon back room shelves and salon dispensary cabinets can become a real mess over time if you don’t take the time to do a little organization and cleaning once in a while. Maybe this post and these pictures will inspire you to tackle your salon dispensary, as well, so you can feel like you’ve done a good day’s work, even on a slow day. Sometimes my “hair and beauty” posts might reflect a little bit of our down time. This would be one of those times. I think all of us here in the salon agree that we did alright today, financially, although it could’ve been better. But we, two of us in particular, made great use of a little bit of a slow day. Have you ever seen someone in the middle of a true cleaning frenzy? I can say for sure, after today, that I now have. My co-workers, Linnie-Pooh and Angel, have really done some major salon dispensary organization today. Shuh-wanda and I pitched in between clients, and now our dispensary looks like a dispensary, instead of a junk room! Our dispensary is a little alcove in our break room filled floor-to-ceiling with wooden shelves. 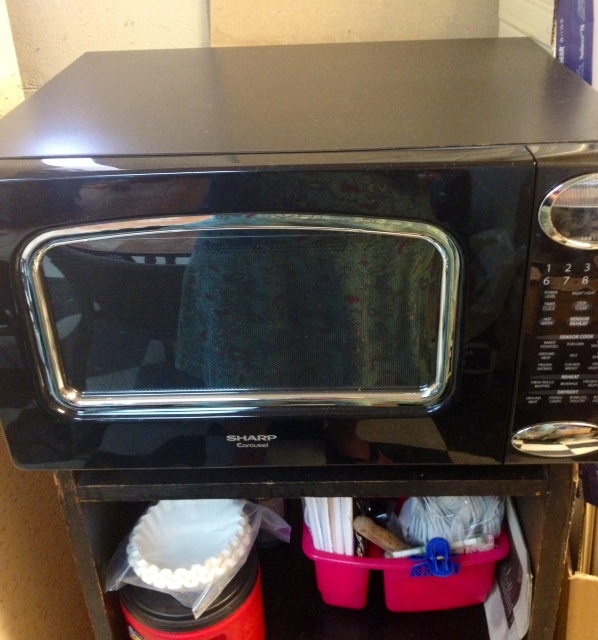 We got a new microwave for our break room (YES! ), but not before we needed it. 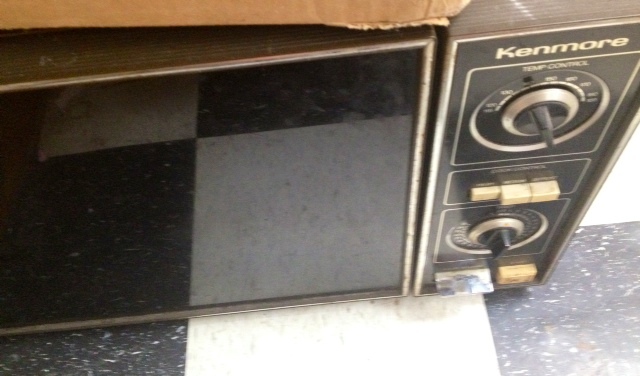 Pretty sure it was the first model microwave, like, ever. 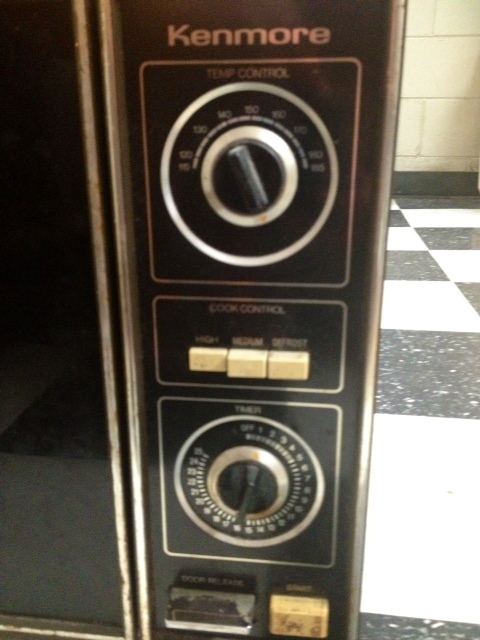 So, in the process of switching out microwaves, they went on a cleaning….and cleaning out…frenzy! Twenty years worth of junk is now getting a proper burial in the county dump, and we are all very relieved to be rid of it! This is how our awesome dispensary looks now. 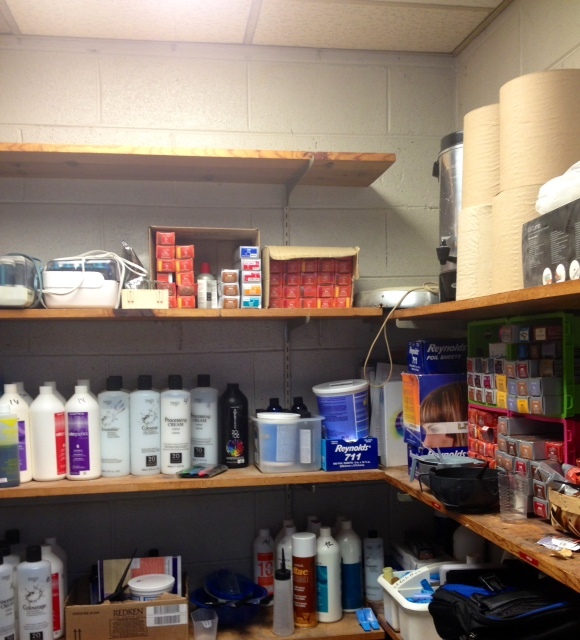 We don’t have salon dispensary cabinets, just shelves, and each stylist has a couple of shelves for her supplies. It’s really easy to let this space get out of hand, because we’re all normally really busy and don’t have time to clean up after ourselves like we should. Not only that, but the previous owner was a little bit of a hoarder, and had a habit of just tossing everything up on one of these shelves and leaving it there for eternity. We threw away old, grungy holiday decorations, empty curling iron boxes, and other artifacts that had probably been hanging out since the salon opened back in the 80’s. 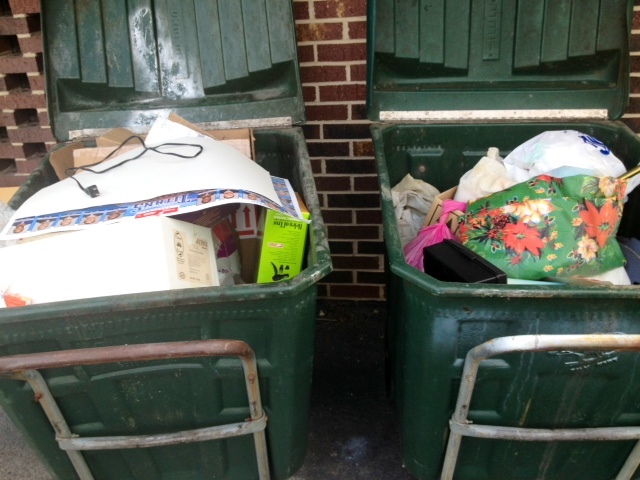 I don’t have any before pictures, but considering our two trash carts (which got emptied by our super-cool waste management employees at 9:00 this morning, and were empty when the girls got started) looked like this after our cleanup. I don’t think before pictures are necessary. 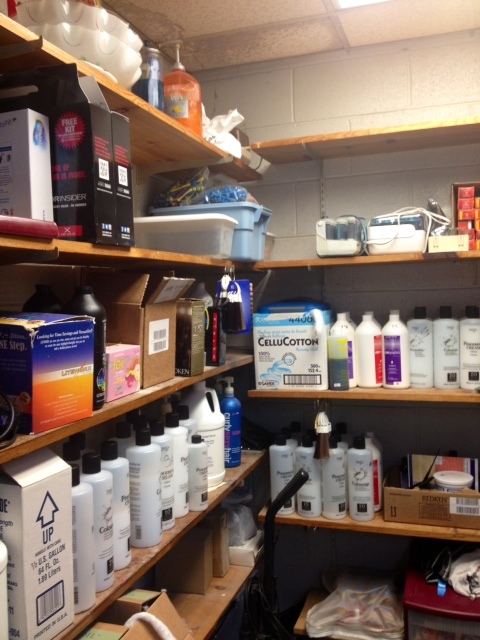 Everything in the previous pictures was already on those dispensary shelves, along with everything you see here. Yikes! That is some seriously awesome salon dispensary organization! I wonder how much hair was inhaled and ingested today? *cough cough! It doesn’t take long for a salon full of women to accumulate a lot of stuff. Every now and then, you just have to PURGE! It shows that you take pride in your salon, even in the back room, where only the stylists hang out. Angel, Linnie-Pooh, Shuh-wanda, pat yourselves on the back! We have done a great thing today, even though the hours you all spent on it were not hours that you got paid for. But the cool thing is, we all do this here. We all work together to keep our workplace nice and take pride in our salon. It’s the foundation for our businesses, and I’m so proud to work with each and every stylist here, because we all see the value in a nice work environment! Love you guys! Angel and Linnie-Pooh…you deserve a bubble bath and a massage, and you can tell the Misters I said so! Coming at you tomorrow with a wedding post, and I’ll be having a giveaway soon, so stay tuned! 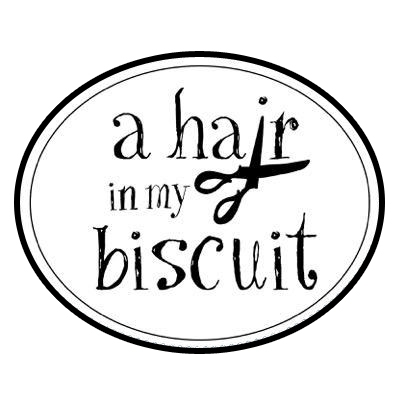 A Special Gift | Is That A Hair In My Biscuit?